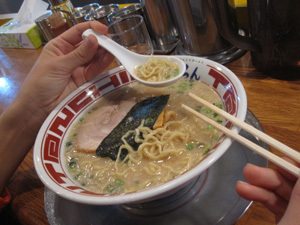 One of our travel specialists recently returned from his trip to Japan. He was kind enough to share some of his pictures and experiences with us! This is How We Travel. March in Japan is an in-between month for Japan tours: winter is ending, but it’s still cold; spring is coming but the buds on the cherry trees are just perceptible. Japan is of course modern and old-fashioned at the same time - Tokyo is the epicenter of modernity, and amidst the concrete you’ll find architectural and design wonders. We flew into Tokyo, where we’d spend some time before heading into the mountains to visit some remote hot spring ryokans (traditional Japanese inns). Our first evening in Tokyo we plunged into a quintessential Saturday-night meal at an izakaya (Japanese-style gastro-pub), where we enjoyed a variety of vegetables and meats in a variety of styles, accompanied by refreshingly cold Japanese draft beer - the ideal first dinner in Japan. 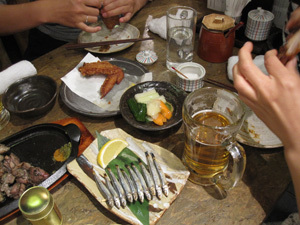 This izakaya was located in the Shinjuku district of Tokyo, and specialized in cuisine from Miyazaki Prefecture. We spent a full day with two nights in Tokyo before activating our Japan Rail Passes in order to leave urbanity for more peaceful surroundings. Our first stop was Chojukan at Houshi Onsen in Gunma Prefecture, located only a couple of hours from central Tokyo. First we took a bullet train north to Gunma Prefecture. 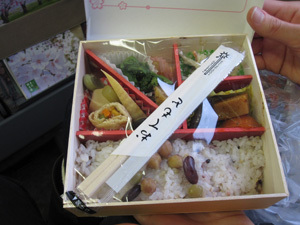 En route we enjoyed a delicious bento (lunch box) featuring seasonal vegetables cooked in a variety of styles. We sped north past the gray landscape, made more gray by the ominous winter sky. After an hour or so, all of a sudden after exiting on the other end of a long tunnel, everything around us was covered in snow (the Tokyo area was freezing cold, but not snow-covered). To get to Chojukan at Hoshi Onsen (“onsen” means “hot spring”), we had to catch a bus, which took us deeper into the mountains, and then connect to a smaller shuttle bus that took us via some windy and narrow mountain roads to the ryokan itself. 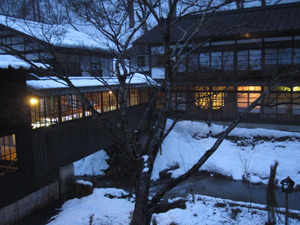 Houshi Onsen is a very traditional onsen ryokan! After shaking off our snow-covered boots in exchange for the ryokan’s slippers, we were shown to our Japanese-style room, where we were served green tea while warming ourselves under the room’s kotatsu (a heated table, designed to heat your legs while you sit at it - a very pleasant and traditional Japanese experience). We changed into yukatas (Japanese-style robes), which would be our outfits for the duration of our stay at the ryokan (we basically only wore yukatas while outside of Tokyo, except for during our train journeys between the ryokans we visited). 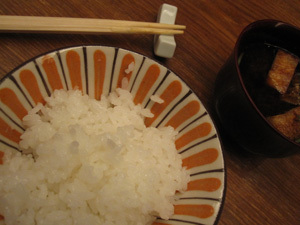 After bathing, there was time for a cup of green tea and a short nap before dinner, which was at about 6 in the evening. 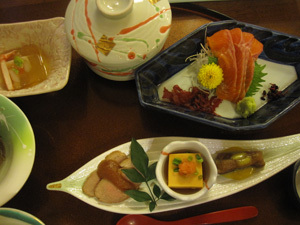 We were full of anticipation for our first traditional ryokan-style Japanese meal. The meal featured more food than we could possibly eat. Yet - looking around - every Japanese person around us managed to effortlessly put it all away, which we found remarkable. The meal featured fresh seafood, local vegetables (both cultivated and foraged), and local rice. Some of the highlights were the pickled vegetables, the catfish served over a local apple, the miso soup, and the delicious local rice. 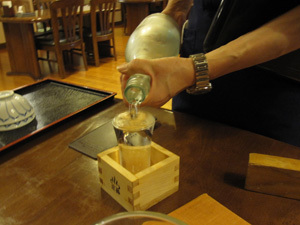 It all went quite well, as Japanese food often does, with a draft beer. We rose early to catch the morning light on the snow. We had one more chance to take in the baths before it was time to check out and catch the shuttle bus back to the bus station, from where we could catch the bus back to the bullet train station. While waiting for the shuttle bus to arrive, we were treated to some lovely tea around the irori (a sunken fire pit/hearth). Our next stop was in Nagano prefecture. Nagano is most famous for its Alps, and internationally best known for having hosted the winter Olympic games in 1998. Nagano is the name of the Prefecture, and also the main city within the Prefecture. Nagano City is a charming city surrounded by hills, a moderately-sized city with urban elements but a laid back atmosphere, thanks to its manageable size and fairly remote location. 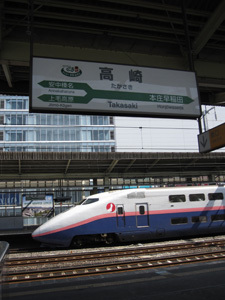 In fact, it is just about 2 hours from Tokyo on the bullet train, but being in Nagano you feel as if Tokyo is worlds away. Even if you only have 2-3 hours available in transit from one place to the next (as we did), it’s worth making the walk from Nagano Station to Zenkoji Temple, one of Japan’s most impressive temple complexes. The city of Nagano was actually built around this temple complex. 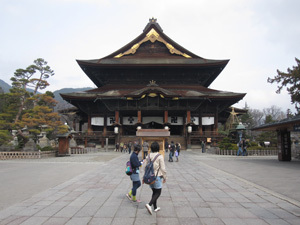 The temple is over 1,300 years old (it was built in the 7th century), and is a major pilgrimage site to this day. The walk from the station up to the temple complex takes you through about 1.5 km worth of city, passing along a mix of modern and traditional streets, until you begin to enter the massive temple area, which is surrounded by other less major temples, a plethora of older traditional buildings, sweets shops and soba shops (Nagano is famous for its soba), little alleyways, incense sellers, and stalls specializing in “oyaki,” the local treat of vegetarian steamed buns. 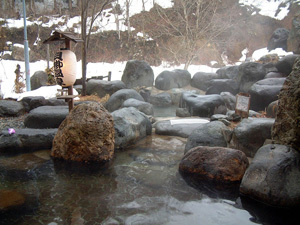 Our next onsen stop was Kaikake Onsen, located deep in the snow country of Niigata Prefecture, to the north of Tokyo. Deep walls of snow surrounded us; even in March the snow showed no sign of disappearing! Niigata’s climate is harsh, and the people are tough. Our host at Kaikake told us that just a week earlier the snow had been a meter higher, but even now it was close to 2 meters deep! 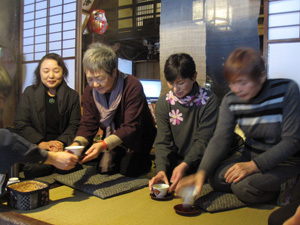 We checked in, and were served a delicious cup of local tea while we waited. We were shown to our room, where we again exchanged our civilian clothes for the onsen-ryokan outfit of yukata. We wasted little time in heading to the outdoor baths, where we could sit and relax in the hot springs contemplating the snow everywhere, bare trees waiting to bloom with life, and peace and quiet of the remote north. Dinner here was another delicious adventure, filled with fresh local vegetables, seafood, and more. Part of the fun of a ryokan is not exactly knowing what all the dishes are, but they were beautiful to behold, and for the most part delicious. Our waitress explained as much as she could to us, but we were left guessing about a few of the items, which were nevertheless artfully presented and fascinating. As always, we left stuffed. At ryokans, the meal ends with freshly-cooked local rice, and in Japan rice connoisseurs critique rice the way cheese experts would in France. Tasting each region’s rice was definitely a highlight of the trip. We finally made our way back to Tokyo, having experienced some once-in-a-lifetime (or perhaps a few times, in my lifetime) memories!